In Latin America and the Caribbean, as well as in the United States, the Zika epidemic has exposed the often hostile policy, programmatic and legal environment women face on issues surrounding pregnancy. Policymakers’ long-standing failure to prioritize women’s health and autonomy has left women—particularly poor women—in many countries more vulnerable to the consequences of Zika than they would otherwise be. Policies and resources to support the rights of women to prevent pregnancy, obtain safe abortion care or become a parent and raise a child should be an ongoing priority, rather than something that receives fleeting attention at a moment of acute crisis. The specific challenges posed by Zika are new and still emerging. But the current emergency has highlighted another long-standing public health challenge: the often hostile policy, programmatic and legal environment women face on issues surrounding pregnancy, whether they are looking to have a healthy birth and raise their child, prevent an unplanned pregnancy or obtain an abortion. All women should have the right to self-determination when it comes to decisions about pregnancy and childbearing. Unfortunately, the reality of women’s lives often falls far short. 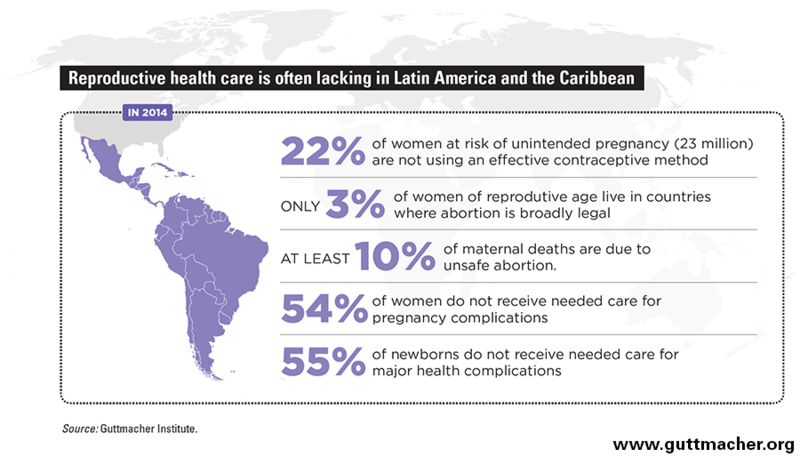 In 2014, 23 million women in Latin America and the Caribbean wanted to avoid pregnancy but were not using a modern method of contraception,6 which contributed to well over half of all pregnancies in the region (56%) being unintended.7 And these statistics are likely even higher now, because the emergence of Zika may have prompted more women and couples to want to delay pregnancy or avoid it altogether. Meeting all women’s needs for modern contraception in the region would cost an estimated $1.7 billion annually.6 Given that such spending already stood at $1.1 billion in 2014, the needed additional annual investment is roughly $600 million, which would cover new contraceptive users and provide improved quality of care for current users. Debates are underway in some countries in the region about decriminalizing abortion in specific circumstances in response to the current crisis. But narrow exceptions, even if enacted, are unlikely to address the range of circumstances under which women will likely seek an abortion, in response to the Zika epidemic or otherwise. Moreover, lifting any restrictions on abortion must go hand-in-hand with training abortion providers and taking other steps to make services accessible and safe, including ensuring that women know services are available and where to obtain them. At every step of the way, the impact of Zika in Latin America and the Caribbean is falling hardest on those with the fewest resources. Poor women, including those living in remote areas, have the least access to high-quality contraceptive services to prevent pregnancy.6 They are also the least protected from mosquitoes that transmit the Zika virus—for instance, because of poor sanitation where they live or work (which allows mosquitoes to breed more easily), or the inability to afford repellent.11 When they decide to terminate a pregnancy, whether out of fear of Zika or for any other reason, poor women are less likely than other women to have access to safe abortion care, which puts them at higher risk of complications and prosecution from clandestine procedures.8,12 In addition, women with few resources are often lacking necessary services to help them have a healthy pregnancy and birth (see graphic).6,8 Finally, they are least financially equipped to access the medical and social supports that a child with a disability may require. The response to Zika from governments in Latin America and the Caribbean has often been inadequate, which is in part a reflection of a long-standing neglect of women’s health. In particular, blanket recommendations that women should avoid pregnancy over long periods of time are problematic; governments in Brazil, Colombia, Ecuador and El Salvador, among others, have recommended women should avoid becoming pregnant altogether.13 Brazilian officials have told women in the most affected areas to avoid pregnancy indefinitely, while El Salvador has recommended waiting until 2018.14 Such advice rings hollow in the face of countries’ ongoing failure to provide women with access to the range of contraceptive services that would help them prevent pregnancy, if they so desire. In addition, these unrealistic recommendations shift the burden of responding to the current public health crisis to individual women. Doing so potentially exposes women to blame and stigma should they become pregnant or give birth to a child with a disability. This in turn leaves affected women—especially those who are poor, young or otherwise lacking resources—even more vulnerable than they might otherwise be, whether through abandonment by their partners or families, or through lacking government support to help them and their children during and after pregnancy. Although the situation in the United States is different from that in Latin America and the Caribbean, U.S. women face many similar challenges. This includes long-standing failures by policymakers at the federal and state levels to ensure adequate access to sexual and reproductive health coverage and care, including contraceptive services and, especially, abortion care. As is the case in Latin America and the Caribbean, those in the United States with the fewest resources may be at the greatest risk of negative health and economic consequences from Zika. Poor women and women of color fare worse than others on a range of critical indicators, from access to health insurance to unintended pregnancy rates to difficulty obtaining a needed abortion.15,16 Disadvantaged women are also more likely than others to lack the resources to parent a child born with microcephaly, a situation that is further exacerbated by an absence of affordable health care, paid family leave, paid sick leave and a living wage for many women and families. 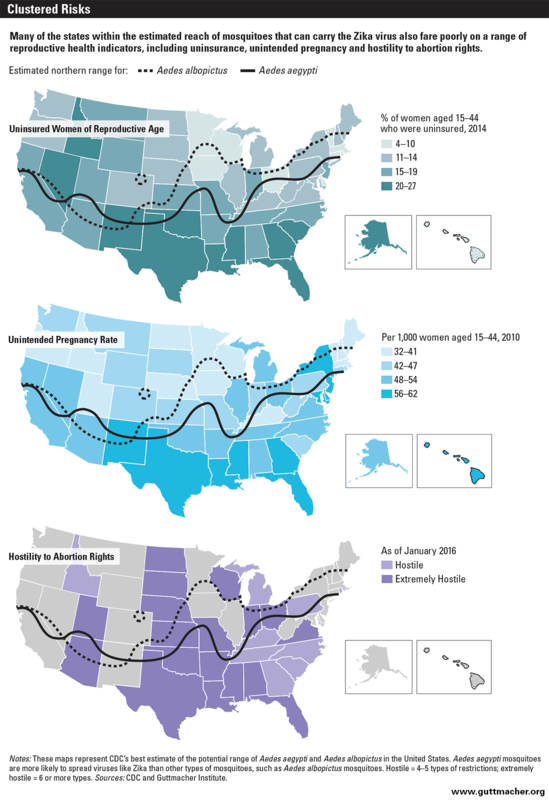 Many of the states thought to be at high risk of Zika have high unintended pregnancy rates as well; once again, Florida, Georgia, Louisiana, Mississippi and Texas are all among the top 10 U.S. states.22 Moreover, women in these states who are facing an unwanted pregnancy and have decided on abortion generally face a hostile environment when it comes to accessing abortion care.23 Twenty-seven states have been categorized as “hostile” to abortion rights—and 18 of them as “extremely hostile”—because of the myriad restrictions they have imposed on women seeking abortion care and on providers that offer it. Most of the states in the South and mid-Atlantic regions fall into the hostile or extremely hostile categories. As a result, obtaining an abortion has become more costly and time-consuming, and can be out of reach for women who are poor or otherwise vulnerable. The ongoing policy failures in many U.S. states are reflected at the federal level as well. While the Obama administration has initiated various steps to counter a possible Zika epidemic (for instance, by steering additional funding for family planning services and related care to heavily affected Puerto Rico),26 conservative lawmakers have fought against policies and programs that are key to combating Zika and its potential impact. This includes repeated attempts to repeal the ACA and, with it, the many gains it has brought—including for insurance coverage, generally, and more robust contraceptive coverage, in particular. Other attacks on women’s health include efforts to defund the federal Title X family planning program, which underpins the nation’s network of safety-net family planning centers. Projections of the potential reach, impact and severity of the Zika epidemic in Latin America and the Caribbean and in the United States keep changing. But there is a common pattern where ideologically and religiously rooted hostility to abortion and contraception has left far too many women vulnerable to the Zika virus. This is unacceptable as a matter of public health, as well as a matter of human rights. The very real threat posed by the Zika virus once again underscores why all women—whether in the United States, Latin America and the Caribbean, or elsewhere in the world—must have the necessary counseling, information and services to prevent unintended pregnancy, safely terminate an unwanted pregnancy (and receive treatment for complications from unsafe abortion) and carry a wanted pregnancy to term. Women also must have access to the medical, social and economic supports that are necessary to raise their child securely and with dignity, especially if their child has a disability. Further, as public health responses intensify and women in some circumstances are warned against becoming pregnant, governments and health care providers have a responsibility to protect individuals—especially women of reproductive age—from discrimination and coercion. Women’s decisions about whether to use birth control and which method to use should be based on voluntarism and informed consent. The same applies to women’s decisions about whether to carry a pregnancy to term or end it. Importantly, these principles are universal and apply well beyond the current Zika crisis. The simple fact is that had women’s health and well-being always been a priority, which it should be by right, affected countries would have found themselves in a far stronger position to respond to the current emergency. Sound policies and resources to support the rights of women to prevent pregnancy, obtain safe abortion care or become a parent and raise a child should be an ongoing priority, rather than something that receives fleeting attention at a moment of acute crisis. 1. World Health Organization (WHO), Zika situation report, Apr. 7, 2016, http://www.who.int/emergencies/zika-virus/situation-report/7-april-2016/en/. 2. Centers for Disease Control and Prevention (CDC), Facts about microcephaly, Apr. 7, 2016, http://www.cdc.gov/ncbddd/birthdefects/microcephaly.html. 4. Centers for Disease Control and Prevention (CDC), Zika virus disease in the United States, 2015–2016, May 11, 2016, http://www.cdc.gov/zika/geo/united-states.html. 7. Sedgh G, Singh S and Hussain R, Intended and unintended pregnancies worldwide in 2012 and recent trends, Studies in Family Planning, 2014, 45(3):301–314. 9. Unpublished data from Singh S et al., Adding It Up: The Costs and Benefits of Investing in Sexual and Reproductive Health 2014, New York: Guttmacher Institute, 2014. 10. Singh S et al., Facility-based treatment for medical complications resulting from unsafe pregnancy termination in the developing world, 2012: a review of evidence from 26 countries, BJOG, 2015, doi:10.1111/1471-0528.13552. 11. CDC, Zika, mosquitoes, and standing water, Mar. 22, 2016, http://blogs.cdc.gov/publichealthmatters/2016/03/zikaandwater/. 12. Dzuba I, Winikoff B and Peña M, Medical abortion: a path to safe, high-quality abortion care in Latin America and the Caribbean, The European Journal of Contraception and Reproductive Health Care, 2013, 18(6):441–450. 14. McNeil DG, Growing support among experts for Zika advice to delay pregnancy, New York Times, Feb. 5, 2016, http://www.nytimes.com/2016/02/09/health/zika-virus-women-pregnancy.html. 15. Guttmacher Institute, Induced abortion in the United States, Fact Sheet, New York: Guttmacher Institute, 2016, http://www.guttmacher.org/fact-sheet/induced-abortion-united-states. 17. CDC, Estimated range of Aedes albopictus and Aedes aegypti in the United States, 2016, Apr. 1, 2016, http://www.cdc.gov/zika/pdfs/zika-mosquito-maps.pdf. 18. CDC, Zika and pregnancy, Apr. 1, 2016, http://www.cdc.gov/vitalsigns/zika/infographic.html. 22. Kost K, Unintended Pregnancy Rates at the State Level: Estimates for 2010 and Trends Since 2002, New York: Guttmacher Institute, 2015, http://www.guttmacher.org/sites/default/files/report_pdf/stateup10.pdf. 25. Guttmacher Institute, State policy updates, Apr. 1, 2016, http://www.guttmacher.org/state-policy.